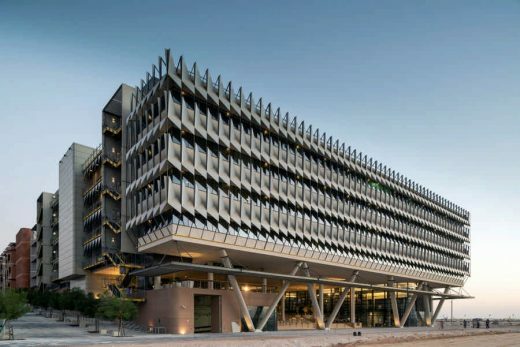 Multi international award-winning building achieves LEED Platinum standard, making it one of the most sustainable buildings in the Middle East. Sheppard Robson’s Siemens Middle East Headquarters at Masdar City, Abu Dhabi, officially opened this week, establishing a new benchmark for sustainable office buildings in the Middle East. The 22,800 m2 structure, which floats above a new public plaza, is the result of a stringent brief. This was proposed by Siemens and MASDAR then developed by Sheppard Robson to create a building that is truly optimised for its purpose, delivering the most sustainable building possible for the same cost per square metre as a typical headquarters in the UAE. The Siemens Middle East Headquarters is one of the first buildings in the region to achieve LEED Platinum. The sustainable credentials were achieved through combining traditional design and parametric analysis to deliver an efficient and compact form that uses less material and minimises embodied carbon. The office floors – over 60% of which are occupied by Siemens – float above and shade the public plaza, which connects the level change between the existing adjacent podium and the more formal square. The plaza has been designed as a terraced extension of the existing public realm and encourages pedestrian movement within the heart of the site. This shared public space is further enhanced by a series of external ‘rooms’, retail units and two fully glazed office receptions. The building’s envelope was conceived as a box within a box. The inner section is a highly-insulated, airtight façade designed to reduce thermal conductivity; surrounding this is a lightweight aluminium external shading system that minimises solar gain whilst maximising daylight and views from the building. The variation in the form of the shading systems, characterised by light-weight aluminium fins, creates a strong architectural language for the building, with each facade tailored to suit its solar orientation. The building’s super-sized floorplates, each measuring 4,500m², have been optimised for efficiency, daylight and flexibility using parametric modelling and achieves over 90% efficiency. The floor plates, punctuated by nine atria and served by six perimeter cores are completely column-free. An innovative structural system reduces the material used in construction by approximately 60% and provides maximum flexibility for the office space planning. The arrangement enables each of the four office floors to be subdivided into a combination of various space sizes and therefore creates flexibility for the building to be remodelled over time to accommodate up to 32 tenants. David Ardill, Partner at Sheppard Robson, said: “The reception of the building, both locally and internationally, has been fantastic with many recognising the potential for applying the findings from the project to other schemes in the Middle East and beyond.